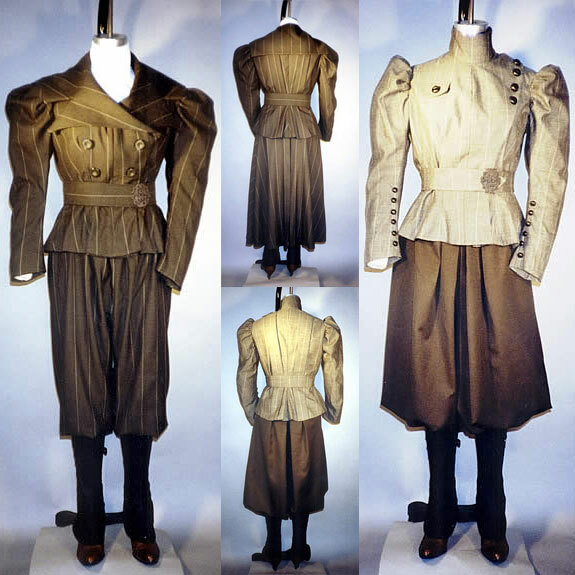 1840s to 1860 Ladies’ Pleated Wrapper, Morning Dress, Work Dress and Maternity Dress with pleated bishop or pagoda sleeve, with or without standing collar. This dress has a dropped shoulder typical of the time period. It falls freely from the bottoms of the yokes, with no fitted lining underneath. 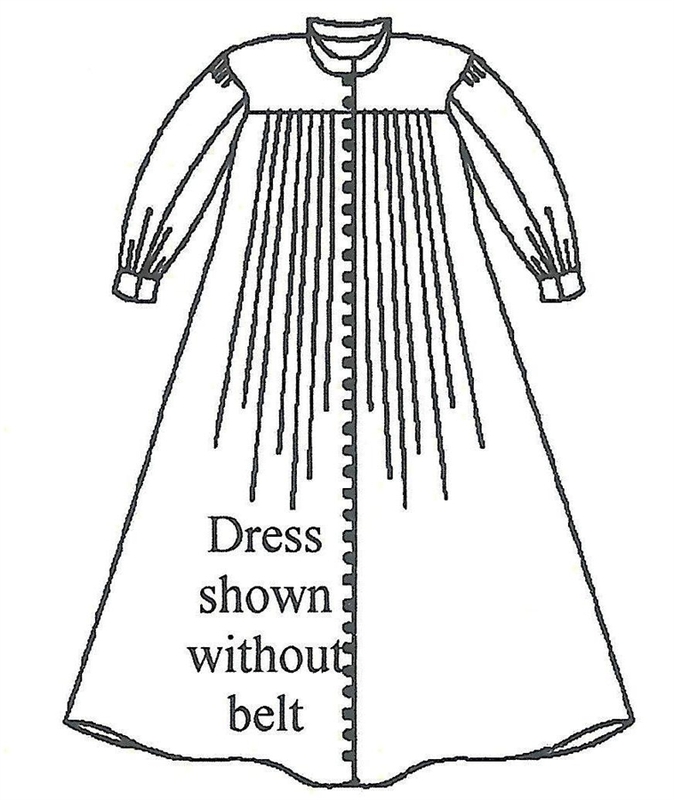 The dress is shown pleated to the yokes but can be gathered instead. View A is a bishop sleeved wrapper with a standing collar. View B has a small pagoda sleeves with a piped jewel neckline. 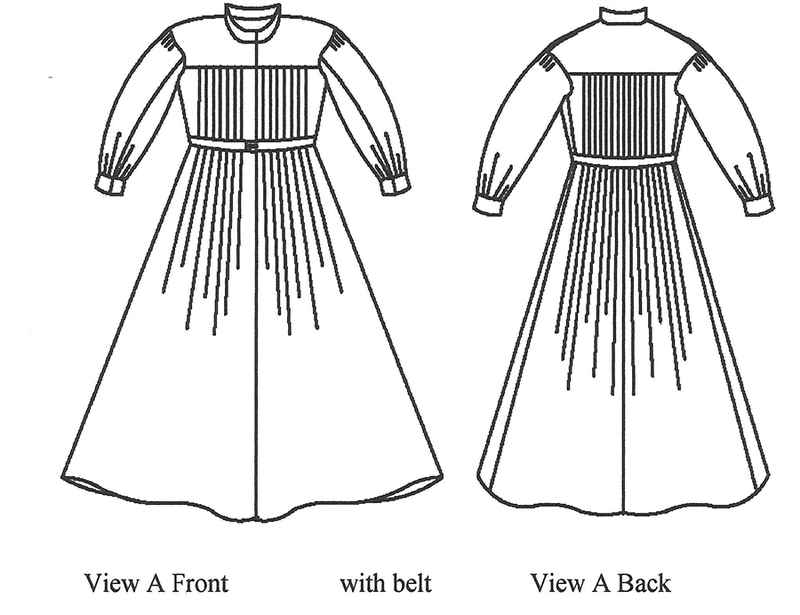 Both views can have the pleats stitched down at the waist or left loose, and the waist can be confined with a belt. 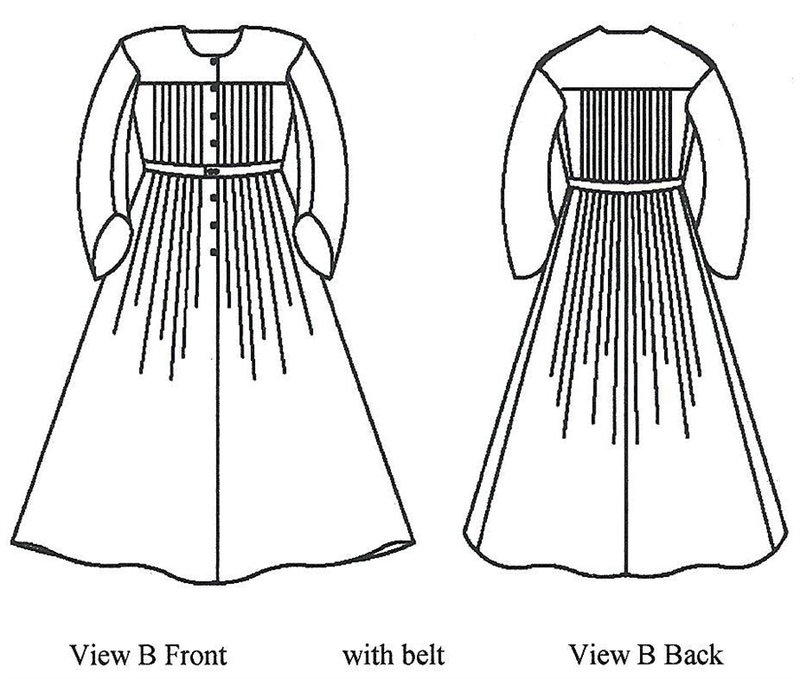 Both have piping at the armholes, across the bottom of the yokes, and View B has a piped neckline. The front opening can be left open from top to bottom using closures of buttons or hooks and eyes, or stitched closed from below the waist to the hem, using closures from the neck to the top of the stitching. An optional pocket is included. Notions: Both views - 8, 1/2” buttons or 14 hooks and eyes, many more will be required if the dress buttons all the way to the hem. Fine cotton cooking twine or cotton knitting yarn for the piping. This dress was copied from a existing wrapper example dated 1840 in the collection of the author. This style would have been worn from the 1840s to the late 1860s. This type of dress was called different names according it’s purpose. It is a morning dress, or wrapper, meant for informal wear.at home. If it is made with finer more expensive materials it is a gown suitable for a wider range of occasions, including receiving visitors in the home. 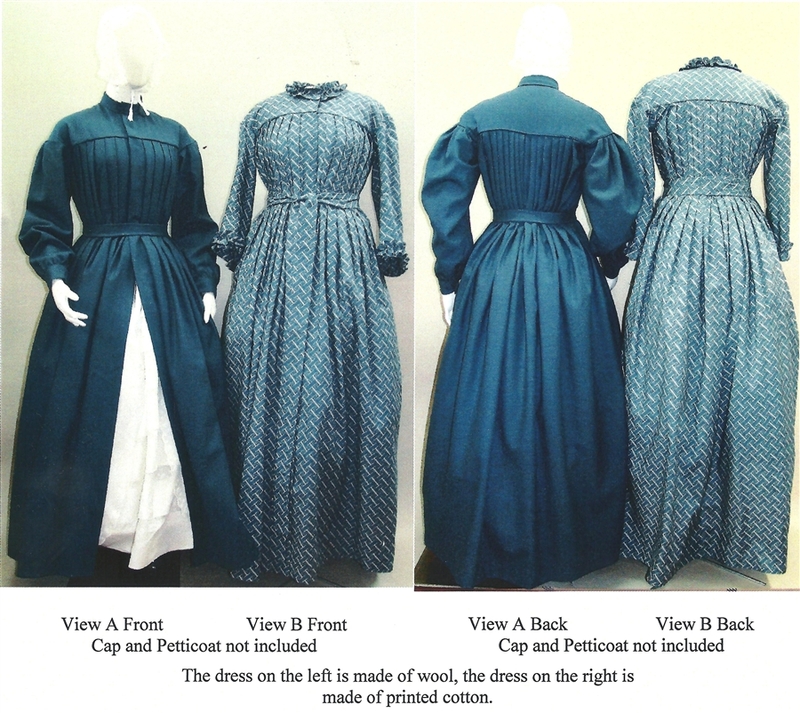 If it is finished plain, it can also be called a work dress. Worn loose it can be worn for maternity. This dress is perfect for impressions of rural or life on the frontier. It will fit a wide range of figures making it a good choice for “costume closets” that have clothing to lend to new or temporary volunteers for reenactments. 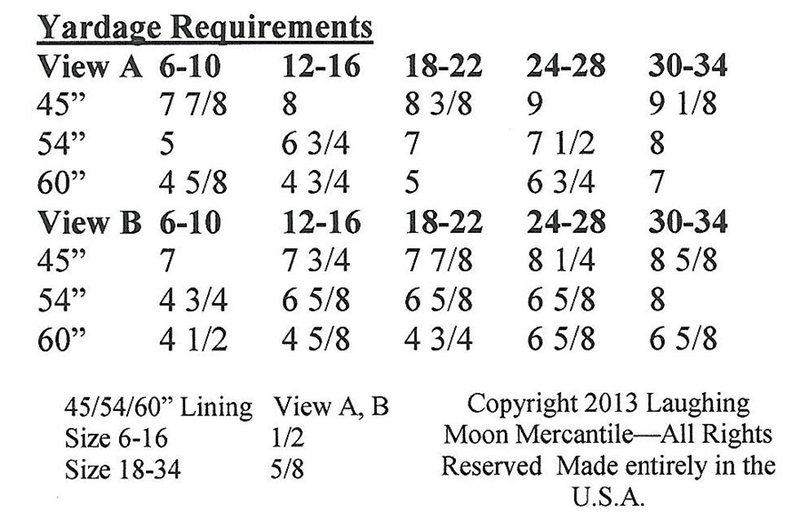 Check the skirt circumference to see if it will fit over your hoop without adding to the skirt width.